Ballymaguigan are through to the Derry Intermediate final. A first half Michael Spiers goal set Ballymaguigan on their way to the Derry Intermediate final with a easier than expected victory over a Drumsurn team that will rue a couple of gilt edged goal chances that got away. Spiers struck with a superb shot into the top corner from a Barry McGlone pass seconds before the half-time whistle but in truth the goal owed as much to a melee on half-way as it did to Ballymaguigan's impressive build up. Drumsurn were building under main stand with half-time fast approaching when Sean Brady and Daryl Mullan tangled. Other players joined the fracas that resulted in a pair of yellow cards for Brady and Mullan. However, when referee Gregory McWilliams threw the ball up after calm was restored, it was the St Trea's who won possession and they raced down the pitch in a move that finished with Spiers flashing his brilliant shot past Steven Harbinson. It was the game's pivotal moment and provided Ballymaguigan with a cushion they rarely looked like relinquishing in the second half. Yet it still took two outstanding saves from keeper Aaron Cassidy to keep Drumsurn at arm's length. First, he denied Ruairi Rafferty with a great block that yielded the Drumsurn forward only a point when the goal was beckoning producing an even better stop to keep out Daryl Mullan after he had been teed up by Rafferty. In truth, had either hit the net it would have been harsh on a Ballymaguigan outfit who were the better side throughout and who continued to build on some excellent Championship displays to date. Ballymaguigan set up with full forward Darren Conway looking isolated inside, no other man in green and yellow within 40m of him at times but it was a ploy that worked perfectly for Paddy Downey and his team. Conway was the ideal target man and the extra room afforded him by his isolation was all he needed to give Daniel McNicholl a difficult opening 30 minutes. It also provided acres of space for willing runners like Michael Spiers to gallop into and Ballymaguigan took full advantage as they built a 1-09 to 0-4 half-time lead. Ironically, at the other end of the pitch, Drumsurn's Tiarnan McHugh was provided a similarly effective service to Conway, constantly out in front and winning ball, but St Matthew's didn't utilise him the way Ballymaguigan did Conway. Drumsurn got the scoreboard moving Michael Mullan took a short free from McHugh and split the posts. That was quickly levelled by a Daniel Badley free but Mullan again edged Drumsurn in front seconds later. That was in the fourth minute and it was the last time St Matthew's would lead. Spiers equalised before Conway took a lovely catch before defying an ridiculously acute angle to split the posts from close to the bye-line. Conway then set up Ciaran McIvor and Sean Brady and Ballymaguigan had a three point lead at 0-5 to 0-2 after the first quarter. Drumsurn hit back with points from McHugh and a lovely score from Cahir Mullan but Ballymaguigan were always in control with Conway once again producing a vital score as he held off two backs to increase the St. Trea's lead. Daniel Bradley and Spiers added to the tally before the Spiers goal provided a cushion Ballymaguigan never looked like losing in the second half. The second half proved an anti-climax. Scoreless for 11 minutes Drumsurn needed a goal and Ballymaguigan were cute enough to ensure they were never going to get it. Five points was as close as St Matthew's got. Had either of their goal chances hit the net, the complexion of the game may have changed but Ballymaguigan can also point to a potential penalty they never got for a pull on Conway. Ballymaguigan managed the half without undue stress and they will fear no one in the final. After the brilliance of their quarter-final victory over Castledawson, this was a dangerous semi-final and the handled it well without ever having to reach those quarter-final heights again. Not since 2009 has the Intermediate Championship been brought back to Ballymaguigan but this squad has a real opportunity to end that drought. Ballymaguigan: Aaron Cassidy; Shea Bradley, Liam Cassidy, Patsy Bateson; Padraig Martin, Ryan Ferris, Tomas Brady; Johnny Crozier, Tomas Kealey; Ciaran McIvor, Sean Brady; Michael Spiers, Barry McGlone, Darren Conway, Daniel Bradley. 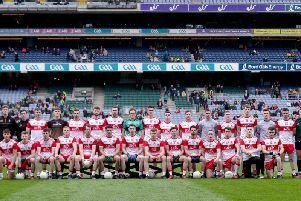 Drumsurn: Steven Harbinson; Sean Butcher, Eoin Ferris, Anthony McLaughlin; Daniel McNicholl, Dara Rafferty, Harry Foster; Cahir Mullan, Daryl Mullan; Tiarnan McHugh, Christopher Harbinson; Michael Mullan, Ruairi Rafferty, Pearse McNickle, Ryan Mullan.